Joe De Sena (left), Spartan Race CEO and Yan Martin (right), Head of Global Brand Marketing at Reebok attend the Spartan Race 2013 Launch in New York City. And then there was the time the U.S. Olympic wrestling team flew to Vermont, where De Sena lives. He arranged for them to be dropped off on some rural byway, ten miles from his farm. As the Olympians schlepped their luggage those ten miles, De Sena’s name was taken in vain more than once. He’s used to it. He often changes the rules, mid-event, or moves the finish line, a subject I was eager to raise with him. SI.com: Perusing “Spartan Up,” I concluded that you are the kind of race director upon whom, during the event, I would have wished bodily harm. Why all the surprises? The event’s grueling enough, and then you move the finish line? We have an amendment outlawing cruel and unusual punishment. Joe De Sena: I thought, 'What makes the really tough days and the really tough weeks? What are the things that happen, that must be overcome?' Well, the finish line gets moved. You’re exhausted, you can’t make payroll—all the things that break you mentally. How could I emulate that, in short-term experience? And hey, the rules changed on me my whole life! SI.com: Let’s hear about that. I know you owned a pool-cleaning business, and then had some success on Wall Street, then became an entrepreneur. What’s been your journey to this place? De Sena: I grew up in Queens, in Howard Beach. It was the organized crime capital of the world. The only reason that’s relevant is that I think it sets a kind of stage for kids growing up there. It forms the messages you’re getting. The neighborhood was all about toughness, and who went to jail, and who got killed. My dad was always angling, like all these other guys were. But my for whatever reason my mom didn’t get into any of that. She got into yoga, meditation, health food—this is the middle of Queens, in the ‘70s, mind you—that made no sense to me at the time, but ended up having a massive influence on me. Now, all that’s been American-ized. Back then it was chanting and beads. It was weird. My mother was teaching yoga, we had monks in our living room, mom was traveling to India. This was unusual. But it was really unusual in the middle of Howard Beach. 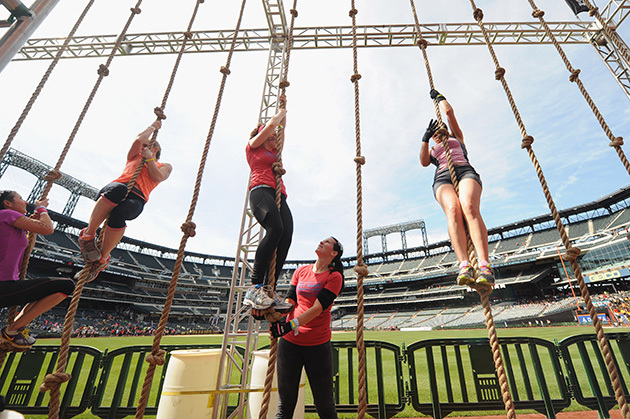 A general view of atmosphere during the Reebok Spartan Race in at Citi Field on April 12, 2014 in New York City. SI.com: So your willingness—your inability not to—go against the grain, is in part a gift from your mother? De Sena: Well, you’ve got to hand it to her. She was out in front, the tip of the spear, [eating health food] going up against every Italian person in the neighborhood with their sausage-and-pepper hero. SI.com: When you talk about your life, the pool-cleaning keeps coming up. It obviously made a deep impression on you. What’s the story with that? De Sena: When my dad’s business went bust, that got me motivated to start this pool business, and I ended up cleaning pools for all these guys. What ended up happening was, this pool business got me 750 views into 750 houses, up close and personal. I got to watch the families that folded, the families that blew up, couples that got divorced, guys that cheated, guys who went to jail, got killed. And what I took away from it was, 'Okay, I’m definitely gonna do that, and I’m not doing that.' I had my own social experiment going and I didn’t even know it. So yes, I’ve been writing Spartan Up! forever. I’ve been intrigued with why some people succeed and others don’t. SI.com: What’s a critical trait to have? De Sena: I’ve made a lot of enemies along the way, whether it’s the races or building businesses, because I hold people to these standards. And ultimately I look back and say what’s the correlation between the 30 people that hate me? They don’t have a work ethic. A work ethic will get you through pretty much anything. You don’t have to be that smart. You don’t have to be polite or good looking. If you have a work ethic, I don’t care what you look like. I want to kneel down and kiss your hand. SI.com: Work hard, but work smart, right? De Sena: One of the things that really intrigues me is persistence. Perseverance is the thing that’s gotten me where I am, and it gets a lot of successful people where they are. But it can also be a killer if we’re climbing a mountain. So perseverance and persistence gets you success in life, and then you apply it to a situation where you’re supposed to turn around, and all the sudden you’ve put yourself in a very bad situation. There was just a woman that died on Mt. Washington, and I think that’s the reason. She turned around too late. SI.com: You talk a lot about accountability, and have cited that as one of the reasons that, unlike Tough Mudder, Spartan events are timed. They’re actual races. How else are you different? De Sena: Timing, ranking, you’re not gonna skip obstacles. There’s accountability, because life keeps you accountable. There’s a higher purpose. I wouldn’t want any part of this event if it wasn’t authentic to the way I want to live, and I want my family to live, and the kind of friends I want to have. So it was never viewed as a "business." We talk a lot about turning the company into a 5013c—making the whole thing a charity. You don’t do that if you came up with it at Harvard, you don’t think that way. (Tough Mudder founder Will Dean is a graduate of the Harvard Business School). That’s not a slam on Will—those guys are killing it. They know what they’re doing. They’re good but we’re different. It’s not where we are. I will look back and say, I did well enough on Wall Street. I didn’t need to blow many, many seven figures on this thing. I still have yet to be paid. That’s not what it’s about. So when you ask what the difference is, I think it’s the authenticity. SI.com: What’s wrong with skipping an obstacle if you’re having a bad morning?